Eight students of the Department of Foreign Languages who are studying Chinese as a second foreign language have completed their free two-week training at the Tianjin National University of Foreign Languages (Tianjin, China). It became possible by virtue of the Agreement on Cooperation between the Precarpathian National University and the Confucius Institute of the Kiev National Linguistic University, which has been signed this year. The training took place within the framework of the annual camp. Our ‘Chinese’ students attended the Chinese language classes, during which they deepened their knowledge of grammar, listening, writing. They also successfully passed the Chinese language proficiency test in accordance with international standards (HSK). Besides studying there were a lot of different master classes. 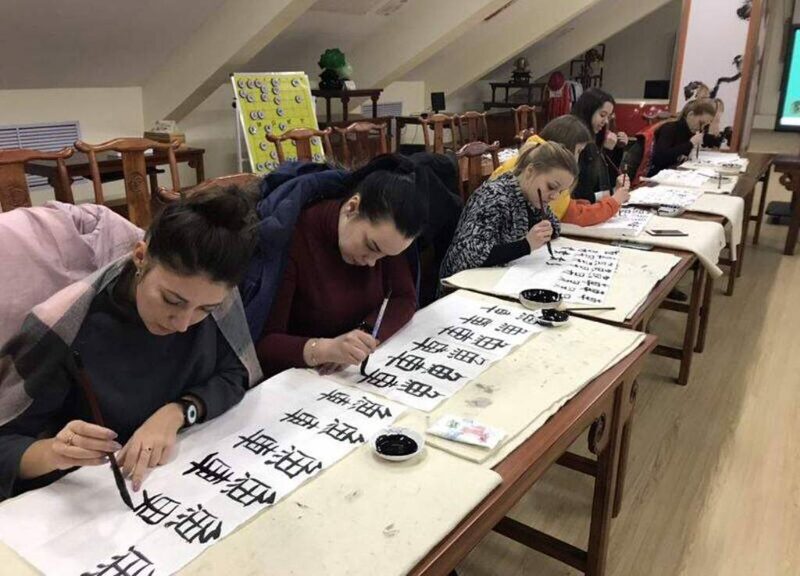 In particular, the students visited master classes in Chinese calligraphy, painting, tea party, martial arts and got acquainted with Chinese musical instruments. All classes were held in Chinese. At the end of the course, our ‘Chinese’ students arranged for the participants of the camp a concert presenting Ukrainian songs. During the two-week staying in China, our university students also had the opportunity to travel to Tian Jin, to visit the capital of the Celestial Empire, the city of Beijing and its various places of interest – the Temple of Heaven, to climb the Great Wall of China. ‘This trip has been instructive and interesting for us. Each day was full of excursions. We visited a lot of museums, places of interest and found out many interesting facts about the history and the present of the Celestial Empire. Also, each of us successfully passed the exam, thanks to our teacher Irina Volodymyrivna Iliichuk, as there were a lot of vocabulary which we had learnt during our university classes. Particular gratitude to the rector Igor Zependa, the Department of Foreign Languages ​​and the Director of the Confucius Institute, Shi Yazunu for such a wonderful study trip. I am sure that the visit to the Celestial Empire will give me an impetus to new heights,’ said student Olja Ivankiv. ‘We have visited museums, architectural monuments, climbed the Great Wall of China, and had various master classes. For two weeks we have been eating with the Chinese sticks only, because it has been a kind of a master class. I am extremely grateful to everyone for such an opportunity,’ said student Olga Fedynchuk. ‘The cooperation of the University with the Confucius Institute of the Kyiv National Linguistic University offers great opportunities for our students in learning the Chinese language. With the assistance of the university leadership, personally, the rector Igor Zependa, the Dean of the Department of Foreign Languages ​​and the support of the Confucius Institute of KNLU, we have the opportunity to hold training sessions and various thematic events with students that contribute to the development of Chinese studies at our university,’ said a teacher of the Chinese language, a senior lecturer of the Department of General and German Linguistics Irina Iliichuk. It should be mentioned that the Confucius Institute of the Kyiv National Linguistic Institute has already been organizing such training camps for ‘Chinese’ students for five years. Next year, our future ‘Chinese’ students will have the opportunity to visit the Celestial Empire again.